Wilson Junior Emmitt Matthews Jr. In a classic battle of Tacoma & Seattle, Wilson travelled north to Franklin to take on the Quakers on their home floor in the Tournament of Champions semi matchup with a final against Cleveland on the line. Anthony Stokes jumped out of the game red-hot from beyond the arc knocking down five triples in the first half prompting a Quaker timeout. Emmitt Matthews Jr. joined the fun by attacking the rim using his length in the pain on offense and defense. Crafty point guard Marquan Williams kept Franklin within striking distance by scoring in a variety of ways and dishing the ball to his teammates. At the break, the Rams held a double-digit lead at 44-33. As the second half progressed, the Quakers started finding their groove from the perimeter knocking down 11 from the Space Needle to not only even the score, but take the lead in the closing moments. However, Dave Alwert was able to rally his troops and guide Wilson to make the necessary plays down the stretch to survive by three points, which was nearly eclipsed on a desperation flurry of Franklin heaves. The Wilson Rams punched their ticket to the Tournament of Champions final in an unorthodox way, but ultimately accomplished the goal. With the 2015-2016 season in the books, here are the final top ten rankings for the 3A Boys classification! Mike Bethea is running out of ring fingers as Head Coach of the Beach Boys captures another state title in a season loaded with quality 3A teams. Convinced the Bulldogs would have played in the championship game if not placed in the same side of the bracket as Rainier Beach. The Irish take the third spot based on the convincing matchups against the Bulldogs in the regular season. Handing Beach a loss in the opening round of the playoffs was impressive. Despite the record, the Lancers found a groove late in the season to propel themselves to the 3A semifinal against O’Dea in a strong finish to the season. A shocking end to a fantastic season leaves some curiosity of what the Wolverines could’ve done in the Hardwood Classic if played again. Coach Petty deserves a ton of credit for arguably the biggest turnaround in the state by making the Eagles a formidable force to the best the state has to offer. Narrows champs completed another year as the class of the 253 finishing down the street at the TDome. Claiming the league title from unquestioned favorite Peninsula was a huge accomplishment; The Lions unfortunately fell short of a trip to Tacoma. A team worthy of playing in the comfy confines of the Tacoma Dome drew Garfield in the regional round who ended the solid Rams season. 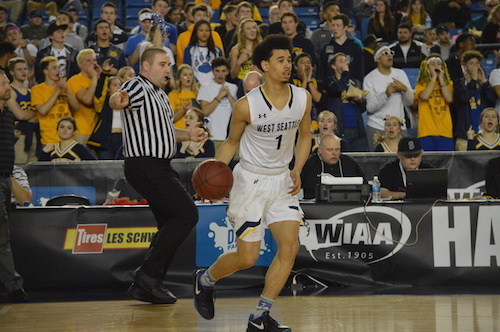 Purdy has plenty to be proud of as Coach Jackson’s first full class of Seahawks completed a strong senior season led by Mr. Basketball JaQuori McLaughlin. 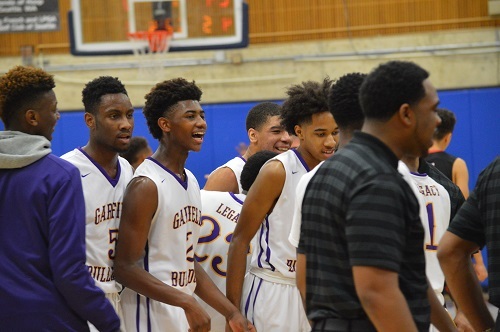 Defending 3A champions Garfield entered this season as a clear favorite to repeat in 2016 given their returning core group and added talent this year. Saturday’s regional contest with Wilson served as the Bulldogs final step to get back to the state tournament. 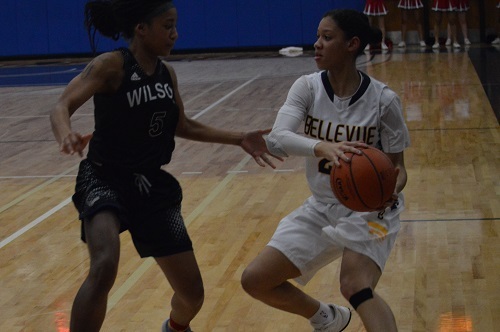 Wilson found themselves in a tough situation early when Garfield’s defense strung together a series of turnovers leading to transition buckets. This stifling defensive display resulted in 33 big first quarter points. The Rams were able to match the ‘Dogs bucket for bucket as the half progressed including five finishing with double digits led by senior captain David Jenkins Jr. who ended with 19. However, the halftime lead created by knock-down Jaylen Nowell jumpers and Terrell Brown slashing to the cup gave them an edge they would not put in jeopardy. As the second half wore on, Wilson’s Nate Fisher found a groove recording a cool 17 points on 6/7 shooting, but former Wilson Ram Alphonso Anderson netted 20 in addition to 8 rebounds. This proved enough to eventually put this game on ice. Afterwards, Anderson talked about facing former friends on Wilson saying, “It was fun playing against the old guys. Dave, Montre; been playing with them since I was little.” When asked about the depth of this talented Bulldogs roster, Anderson responded, “We’ve got pretty much ten division-1 basketball players on the team. At practice, we get each other better.” Finally, he said the defensive intensity shown is a result of the team’s eagerness on offense and that, “Defense leads to dunks, so as many steals as we can get, the more dunks we get!” Ed Haskins finds himself three wins from three state titles in a row, can Garfield complete the task at hand? Posted in Featured	| Tagged game_13701, Garfield, garfield-alphonso anderson, garfield-daejon davis, Garfield-Jashaun Agosto, garfield-jaylen nowell, garfield-pj fuller, Wilson, wilson-david jenkins jr., wilson-emmitt matthews jr.
Leah Krautter’s undefeated Wolverines continued their streak of dominance on Saturday night in Bellevue’s lopsided win over Wilson to earn another trip the TDome in the final week of the season. This game was decided before intermission when BHS took a 46-17 lead into the locker room. Tatiana Streun, Quinessa Caylao-Do, and Anna Wilson led the charge by combining for 36 first half points. Kiki Knox and Erica Hamlin countered with 7 & 6 respectively in the half, but this proved to not be enough. The all-around balance of BHS helped the Wolverines reassure their position as one of the favorites heading into finals weekend. Will Bellevue win the requisite three games to hoist the hardware and claim a perfect season? As league play is in its final weeks and the playoffs are on the horizon, here at the top ten rankings for the 3A girls classification! This Royals team is having a season that will be remembered for years to come. Winning the Tournament of Champions in Arizona as part of an undefeated record shows the Wolverines are firing on all cylinders. If the Braves stay healthy down the stretch, the sky is the limit. Haven’t faltered every time a tough opponent has tried to compromise the Eagles unblemished record! The Rams have put together one of the toughest schedules, and the three losses were by a combined 9 points. Don’t forget about the Islanders that are in Bellevue’s rearview mirror. 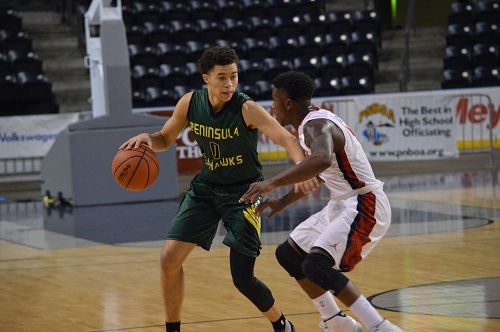 Peninsula and Wilson squared off for an exciting matchup over the weekend in the Showare Shootout in Kent. Listen as Nic Beckman provides an audio recap of the game. 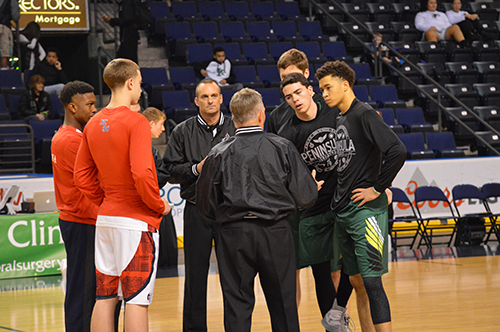 The primetime matchup of the 2015 Showare Shootout featured a heavyweight bout between Peninsula and Wilson. The guard matchup of Seahawk JaQuori McLaughlin and Ram David Jenkins Jr. presented itself early as the two led their teams in scoring with 21 and 28 apiece. Austin Kingman allowed the Seahawks to go into halftime with momentum as the senior forward rushed down the floor in the final moments of the second quarter to finish at the cup at the buzzer. PHS ran into the locker room energized and with a five point lead in hand. Could Wilson strike back in the second half? The intensity heated up as the second half progressed. Jimmy Ritchie and Kingman made big contributions for the Seahawks recording 13 points apiece. Additonally, McLaughlin showed his exceptional scoring ability knocking down several acrobatic shots. Wilson countered with Emmitt Matthews Jr. who finished with 17 points and 7 rebounds. Jenkins helped the Rams tie the game up a 37 apiece midway through the third. Moments later, Wilson was leading and did so until 3 minutes left in the fourth when Peninsula roared back. A 25 point fourth quarter gave the Seahawks a late lead which put Wilson in desperation mode in the waning moments. Jenkins and Matthews made clutch shots to keep Wilson alive, but cold-blooded free throws by Ritchie held off a Ram miracle. 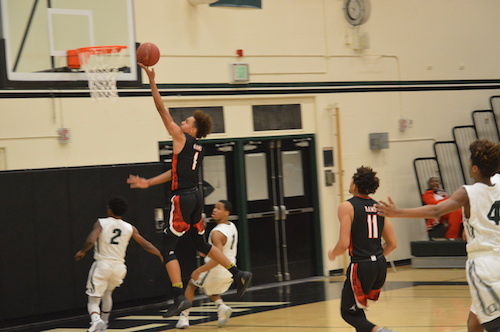 Peninsula escaped with a narrow win against a top Narrows opponent. Posted in Featured	| Tagged game_12211, peninsula, peninsula-austin kingman, peninsula-jaquori mclaughlin, peninsula-jimmy ritchie, Wilson, wilson-david jenkins jr., wilson-emmitt matthews jr. When you’ve reached the final four in all state classifications, you know you are watching good basketball, and the first semifinal game of the day did not disappoint. The matchup was a great one, a 23-3 Wilson Rams team against the 21-5 Eastside Catholic Crusaders. Wilson’s losses this year were to Bellevue and twice to Lincoln, while three of Eastside’s losses were at the hands of the #1 in state Rainier Beach Vikings. One would like to call the first half of this game a defensive battle, but mostly it was an offensive struggle. Both teams were able to work for good looks at the basket, but the shots failed to fall. Also, there were quite a few dropped and tipped passes leading to a good number of 50/50 balls, making this game even scrappier offensively. The teams combined for 13 turnovers and just ten made field goals. The Crusaders took a low scoring 19-16 lead into half. Second leading scorer Matisse Thybulle for the Crusaders played less than two minutes in the first half because he picked up two fouls, and his reinsertion into the line-up made a huge difference to start the second half. He led the Crusaders to a quick 8-0 run to start the second half, giving the Crusaders their biggest lead of the game at 27-16. But the Rams responded with five unanswered to trim the lead back down to six. Thybulle picked up his fourth later in the quarter, but the Crusaders extended their lead when he was in, leading 35-28 entering the fourth. The teams exchanged baskets early in the fourth, with Nathan Christie knocking down a three for the Crusaders to give them a ten point lead with under three minutes to play. Wilson responded with a free-throw from Ivy Smith Jr. and a three from sophomore David Jenkins, cutting the lead to six. Thybulle answered for the Crusaders, converting on back to back layups to bring the lead back up to ten. Wilson couldn’t get within seven points the rest of the way; the Rams converted on a few baskets but their press was broken easily by the athletic Crusaders, leading to easy transition layups. Eastside advances to the state final with a 60-52 victory. What a way to kick off the state tournament! A team from the heart of Seattle against a team from Tacoma in a 3A boys battle. The Wilson Rams came into this contest with a 22-3 record and a regional win against Kennedy to advance to the final eight. The O’Dea Irish, at 17-10, advanced to Tacoma with a win over Shorecrest. As a 9am game, both teams brought great intensity to the Dome despite the early start. Wilson held the edge early, taking the first quarter 17-13 and grabbing an 8 point lead early in the contest. But O’Dea answered in the second quarter with a significant 17-11 rebounding edge, to trail by just three entering the half, 28-25. O’Dea’s leading scorer Jacob Lampkin picked up his third personal halfway through the second quarter, forcing him to sit the remainder of the half. With Lampkin back in for the third quarter, O’Dea began to click offensively. With offensive rebounds leading to easy baskets, the Irish took their first lead since early in the first. The Irish held the slightest of leads going into the final frame, 38-37. The fourth quarter remained close throughout, with neither team grabbing more than a five point lead. With one minute remaining, O’Dea found themselves down three with a good look from the corner from sharpshooter Quinn Barnard. The shot missed just right and Wilson grabbed the rebound. O’Dea fouled on the next possession and Wilson missed both free-throws, leading to another O’Dea opportunity to cut the lead late. Jamar Kemp capitalized on a layup with under eight seconds to play, but the clock doesn’t stop on a made basket, and Wilson was able to trickle it down to three seconds before inbounding. Ivy Smith Jr for the Rams inbounded and was fouled two seconds later; he made both free-throws to bring the lead back up to three with just 0.8 on the clock. A last second heave from the Irish from well beyond half court missed long, and the Rams survived 60-57. In the second to last game at the Muscle Milk pre-season tournament in Kent, the Bellarmine Prep Lions took on the Wilson Rams in another non-conference matchup. Bellarmine jumped out to an early 4-0 lead, converting on two easy layups, but were unable to score for the remainder of the first quarter. Wilson closed the quarter on a 10-0 run that continued into the second. That run extended to a 20-0 run with five minutes left in the second, on the back of a solid diamond press that Bellarmine could not break, leading to easy Wilson transition layups. Seven Rams were able to score in the first half, compared to just four Lions. The Rams took a commanding 33-14 lead into the half. Bellarmine received a good talking to from Coach Salazar at the break and turned their offense on to start the third quarter. An 18-1 run for the Lions cut the Wilson lead just two with one minute remaining in the frame. Bellarmine won the quarter 19-5 and only trailed by five entering the fourth. The Lions’ leading scorer Mar’kese Jackson fouled out with 4:30 remaining in the fourth, really stifling the colossal comeback effort for Bellarmine. The five point margin would be the closest the Lions would come, as Wilson began to battle on the interior and taking advantage of their bonus free-throws. Wilson closed with a strong third quarter and finished with a 51-39 win. With a noisy crowd in attendance at the ShoWare Center in Kent, the Prairie Falcons took on the Wilson Lady Rams in the West Central District Championship game. In a matchup of two top ten teams in state, this game was bound to come down to the wire. Prairie began the contest with a full court box press and a 2-3 zone defense, forcing four Wilson turnovers in the quarter and slowing down the fast-paced Ram offense. However, Wilson was able to capitalize on second chance baskets, snagging five offensive rebounds in the quarter. Senior Tia Briggs for the Rams grabbed three of those offensive rebounds and scored six points to lead the Rams to a 13 point quarter and a tie game after the first. Wilson began to find seams in the Prairie 2-3 zone early in the second, leading to open looks from three and uncontested layups. The Rams exploded for 23 points in the quarter, led again by Briggs with six more of her own. The Prairie zone started to find its groove early in the third quarter, forcing four turnovers on Wilson’s first four possessions and turning those turnovers into five quick points. However, Wilson’s defense tightened up after allowing the transition baskets, and only allowed five more points in the last 5:42 of the quarter. Wilson took a 46-36 lead into the fourth. The Rams took over early in the final quarter, starting on a 15-2 run and extending their lead to as many as 26. Prairie had no answer for Wilson sophomore Kapri Morrow in the fourth; she led the Rams with eight points in the quarter and also grabbed two rebounds and a steal. Wilson won the final quarter 22-6, and took the West Central District title with a 68-42 win.